Oops!! Nine O'Clock Four Times a Day? The MHS Board meets the third Thursday of the month at 9:00a.m. Pratt Hall in the summer, Public Safety Building Conference Room in the Winter. 1. Some Vermonters served in the Confederate Army. About how many? 2. What year did the last Vermont Civil War veteran die? A passerby commented "It seems like you never stop working on that building". "Boy you got that right" I replied. 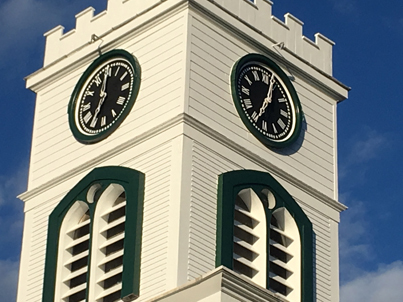 Our clock is 145 years old. As I finished priming the 48 new Roman numerals, cut by Tim Murphy, with counter sunk pilot holes drilled by Pat Farmer, I couldn't help but wonder who did them back in 1985, or 1871? Who had changed the number 4 from IIII to IV to IIII? How did the door in the face that allowed access to the hands disappear? I remembered once again that we are just a few of the people in a long line of people who have risen to the challenge of keeping this structure in good repair, leaving it a little bit better than we found it. I'm grateful for all of them and hope those future generations take up the challenge and think kindly of us 145 years from now, in MMCLXI . 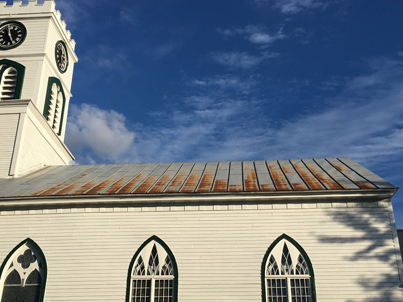 We completed work on the exterior of the top two sections of the tower steeple in late July. 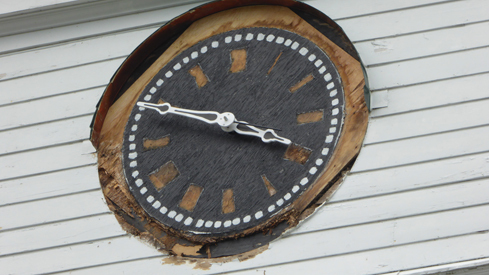 It included complete replacement of the four clock face moldings (fabricated and donated by member Tim Murphy), patching the clock faces, and fabrication / replacement of the Roman numerals. 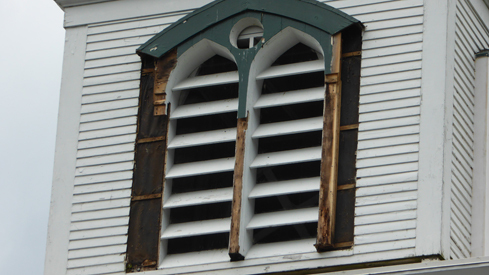 The rotten portions of the beveled, moldings around the lancet shaped louvered bell openings were also replaced, and the crenelation details on top were repaired. The carpentry work was done by Bucky Hoss and Tokyo Bloucher. 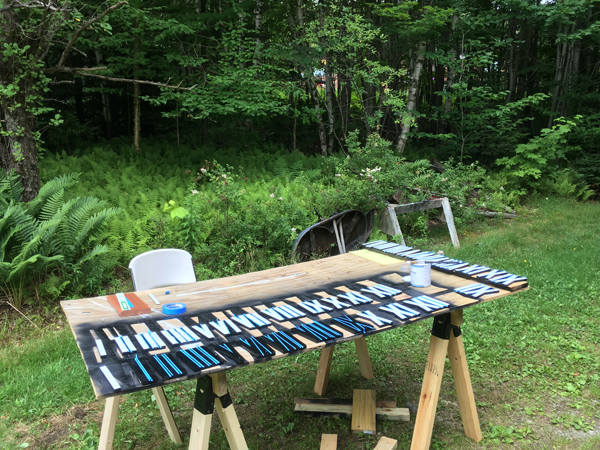 All of it was then painted by member Ted Bruckner and the MHS's Men with Tools. 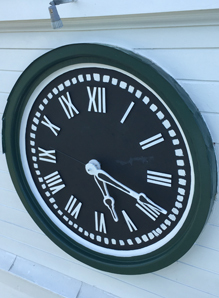 A short slide show chronicling the month long project is on the MHS YouTube channel and is titled "Clock Ver 2.0" Thank you to all involved. Additional work was completed in July. Thanks to the Men with Tools the threshold and front porch were stripped and stained. 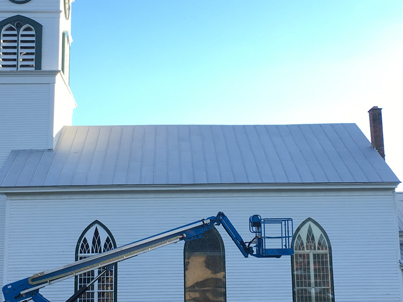 Ted Bruckner also finished the final coats of paint on the West Wall, touched up the lower tower section, and painted the nave's standing seam roof. 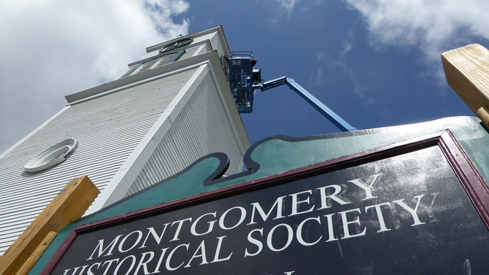 The MHS teamed with the Friends of the Montgomery Library to bring a relatively new bluegrass group to Pratt Hall in August. Over 75 people enjoyed The Onion River Gang's performance in the traditional one microphone style. Their repertoire included traditional blue grass, gospel, and new music. Kudos to Pat Farmer for pulling together. As we approach the holiday season please consider using Amazon Smile for your Amazon purchases. You can shop just like you normally would on Amazon and designate the MHS as your beneficiary. Amazon will donate from their charitable foundation based on what you spend on each purchase. It's small but adds up. Thanks. We had a great response to our reminder letter sent out in August. It's never too late to join. Please help us reach our goal of 200 members for 2016. Remember you can now join or renew via our web site's Membership link and pay using a credit card or Paypal. Just click the Donate button. If you've already joined - thank you! If not, it's never too late. A member appreciation social is tentatively scheduled for Dec 17th and Candles and Carols will be Dec 18th at 5:00 p.m. We will provide the details as soon as we nail them down. Another Successful "Trinkets and Treasures"
Sue WIlson successfully organized another yard sale on August 27th in conjunction with the Covered Bridges Garden Club's Harvestfest, and was ably assisted by Marijke Dollois and Noela McGroarty. Thanks to them and to all of you who helped schlep things, or donated and / or bought items. We also held an open house that day and provided tours of Pratt Hall. MHS hosted the Fall regional meeting at Pratt Hall on Sep 29th. We provided a presentation on Montgomery's Covered Bridges and the Jewett Brothers before our traditional lunch and networking session. Eleven of the 19 societies attended. Many of our visitors were eager to see results of our preservation efforts over the past few years as well. Richford volunteered to hold the next one this Spring. We will reprise our booth at this hyper-local show Dec 10th at the Montgomery Elementary School. Books, cards, ornaments, engraved brick pavers, and more will be for sale. Check out the sale and stop by and say hello. Can't make the show? You can purchase any of these items by clicking the History for Sale link on our web site. Our thanks to Dan Malloy for touching up the quatrefoil and dove he carved on our sign. He is also refreshing the moldings. Dan and Robert Gendron donated their talents to make our new sign a few years ago but the southern exposure had taken its toll. This summer Pratt Hall was used as a venue for a wedding and a memorial service. We remain committed to making the building available to the community for these types of events. 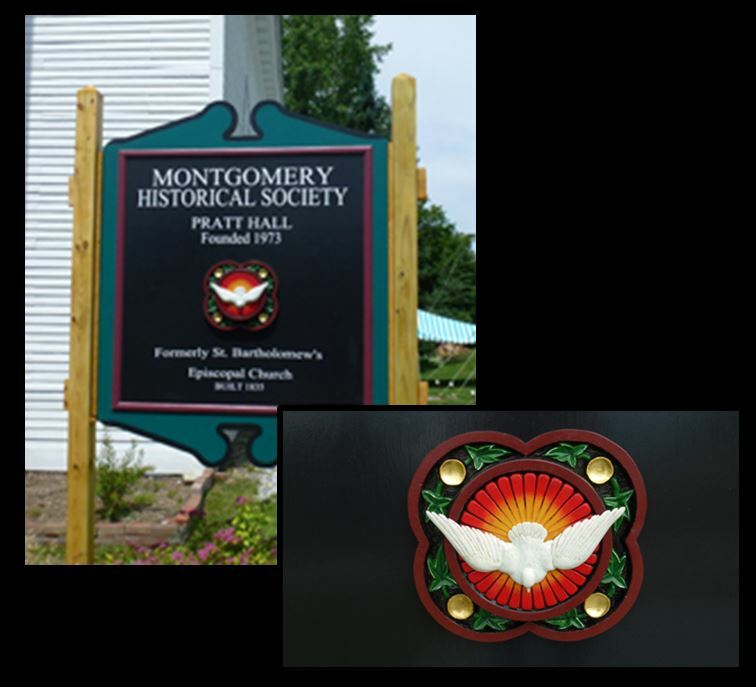 Oct - 1827 People meet to organize "efforts to erect a Church edifice", Union Church, Montgomery's first (now Pratt Hall). Dec - 1959 Opening of the Carinthia Inn (now "The Inn"). Originally the home of lumber baron / mill owner, C. T. Hall. 1. b. About 65 Vermonters are estimated to have served in the Confederate Army. The majority of Vermonters who "went south" moved to a Southern State before the war, some more than twenty years before. One was visiting relatives in Missouri when the war broke out, and apparently joined a local unit without really understanding the political implications. There were at least seven who had joined Vermont units and were taken prisoner, or deserted, and either joined Confederate units or took an oath of allegiance to the Confederacy, and 15 Vermonters, unnamed, were seen in a Chicago prison camp. 3. d. All of the above. She was a 100 percent Algonquin woman who served as a nurse, without pay, with the 11th VT Infantry. Harriet Hinkson Holmes died at 102. She was recognized by a State proclamation in 2002.